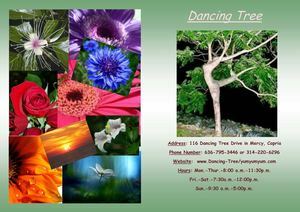 Dancing Tree Address: 116 Dancing Tree Drive in Mercy, Capria Phone Number: 636-795-3446 or 314-220-6296 Website: www. Dancing-Tree/yumyumyum. com Hours: Mon. -Thur. -8:00 a. m. -11:30p. m. Fri. -Sat. -7:30a. m. -12:00p. m. Sun. -9:30 a. m. -5:00p. m.